« The eleventieth pep talk of the year! 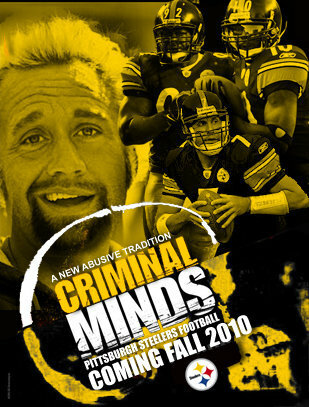 The Steelers have literally become the poster-child for criminal behavior, thanks to this Photoshopped image from somewhere in the dark abyss of the Internet. Asshat10 posted another Tweet,http://twitter.com/santonio10/status/11365247589, saying it was time to “wake and bake”. What happened to drug testing in the NFL? Yeah. But how good was Jeff Reed in Point Break though? I personally think marijuana should be legalized, but as long as it is illegal professional athletes should just say no. I just don’t get the guys like Santonio Holmes and Ricky Williams who not only continue to use it, but also are extremely vocal about it. You are being paid MILLIONS OF DOLLARS to play a game. Why would you risk effing it up for some pot? It’s the same way I feel about the athletes who aren’t in the best physical shape (e.g., Ben Roethlisberger). You’re being paid MILLIONS OF DOLLARS to be an athlete. Hire a team of personal trainers and save the beer & donuts for when you retire. OMG !! !…You mixed the Stillers and my favorite television show in one post…I believe that is the seventh sign…I fear for this day. I want the Steelers to win just as much as any other fan, but I am so tired of athletes like 10, Ben, Skippy, etc. I AM helping to pay their paycheck by going to games, buying Steeler stuff, etc. So show some respect, jag-offs. @CrashJK, did you just equate the Pens with hacks, or am I reading it wrong? The worst part is that I have heard that THC is absorbed by the fat cells. It kills the buzz. Holmes is going to need massive quantities…. @CrashJK No problem, just got confused reading your comparisons, that’s all. Football for me is just something to do until hockey season starts, and something to distract me when the Pens go into their annual midseason slump, so I totally get where you’re coming from : ) Living in El Paso now, I get lots of strange stares at my Pens tire cover and (multiple) Stanley Cup champs t-shirts, LOL.